From April 2016-January 2017, 515,261,906 GP has been made throughout 37,557 runs with a total elapsed time of 3 years, 5 months, 7 days, and 3 hours! 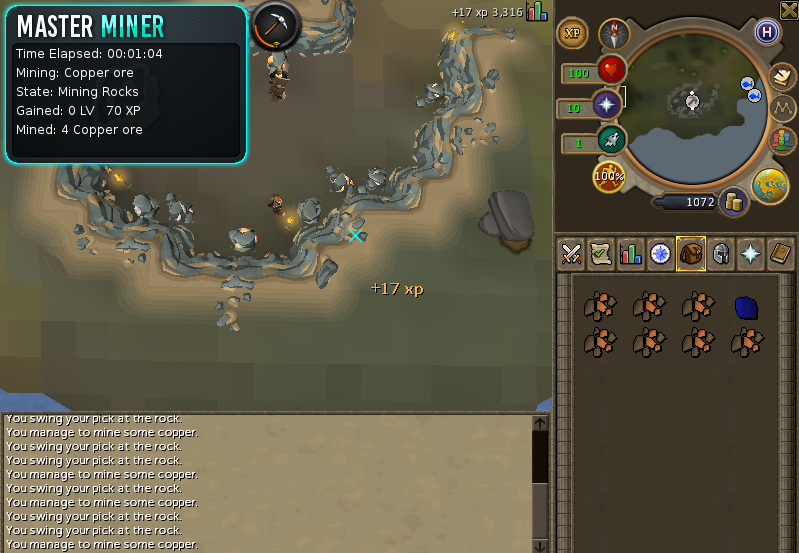 Master Miner is a free mining script for RS3 which could be started at any basic mine. With support for banking and power levelling (dropping ores), as well as Coal Bags, it offers maximum performance through it's modular design. You can install Master Miner through the SDN here. In order for Master Miner to work, please start the script at the mine you would like to mine at. Please select ore - Select the rock you would like to mine from. Power Level - Whether or not to power level. If this is checked, ores will be dropped. Start Script - Once you are done configuring, this will start the script. Power Levelling - This will allow the bot to quickly drop the ores and stay at the mine. Auto-detect Combat Bar - If you have the ore assigned to the combat bar, and you're power-levelling, it will automatically drop the ore.
Anagogic Orts - Automatically collects any anagogic orts which fall to the ground. Banking - Will automatically bank when the inventory is full (disabled when power levelling). Coal Bags - When the inventory is full, it will try to fill the coal bag. If it cannot be filled, it will go bank and empty the coal bag. Dynamic Anti-Ban - The Anti-ban patterns which are used account for human error, babysitting, and typical skilling. Please post any screenshots you have, and I'll post them here. * Fixed Burthorpe mines not recognizing the rocks. hi great script but it cant bank after inventory is full. may i know how do i solve it? I'll check it out later. where is it trying to bank? Varrock bank and thank you! I'm trying to mine in the Al Kharid, it mines two rocks then the status changes to Idle even though Coal rocks respawn. The status never changes back to looking for rocks. ah, since it can't find any rocks, it assumes it's in the wrong area. I'll fix this later today. Force refresh the script page if you can't find the script. not all ores/rocks support this feature, for example, this would not work with clay, sandstone, or granite. The south-east mine is a very inefficient way to mine iron and store it in the bank. Try mining at south-west varrock, rimmington, or Al-kharid.